Soccer tips - Balanced Formations! 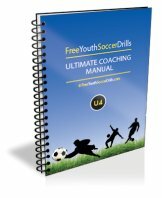 Take a look at these free soccer tips! This page will provide diagrams and explanations on the best formation your team should use. So why choose a balanced formation? Well, a balanced formation is very good in both offence and defence. 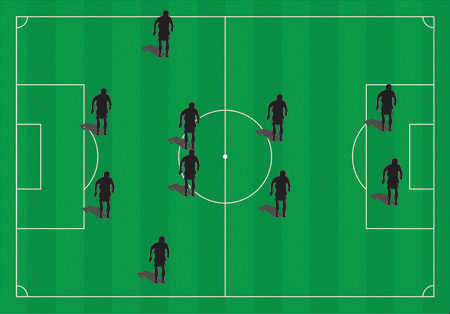 The most popular formation used around the world is the 4-4-2 formation. The 4-4-2 formation plays with a 'back-four' consisting of two central defenders, a left full-back and a right full-back. There are two strikers and four midfielders. Each one of these 4-4-2 formations provides something different. The first one (diamond) can be seen below. The 4-4-2 diamond is popular because it is very easy for the midfielders to know their roles. The left and right midfielders generally stay wide. The two central midfielders however are the ones making the difference. One of them is playing the defensive midfielder whilst the other one is more attacking. The defensive midfielder looks to receive the ball from the defence and play the ball forward or out-wide. He/she will sit in front of the back four and try to break up any opposition attacks. The other midfielder plays ahead of the defensive midfielder. Their role is to link up attacking plays with the strikers and wide players. It is very important that they battle hard in the middle and get back to help defend when required. The next formation is the flat 4-4-2. Take a look at the diagram below. The flat 4-4-2 formation is very similar to the diamond except this time both central midfielders play the same role. Both players will be expected to help defensively and provide the right passes to the wide players and strikers. 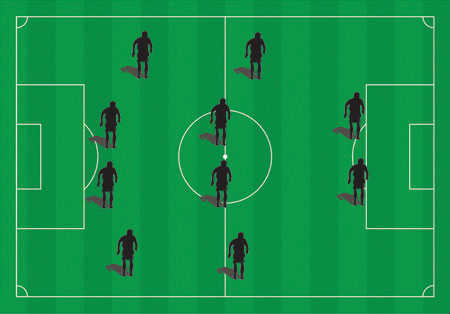 It is important when playing this formation that both central midfielders are capable of playng along side each other. Some useful soccer tips here would be to make sure both midfielders communicate with each other and their team-mates. If you feel your team would be more suited to playing a defensive formation click here! The last 4-4-2 formation looks at having the team play more narrow. Take a look at the diagram below at how centralised the whole team is. The narrow 4-4-2 formation has no wide midfield players. The only wide players your team will have are the two defensive full-backs who may need to push forward in attack. The midfield has two defensive midfielders and two attacking midfield players. This formation works well if you want to win the central midfield battle. Although you will have limited options out wide your team should play all of their passes through the middle up to the strikers. This formation will work well if your opponents are playing with a flat 4-4-2 formation where their full-backs rarely push forward. These are useful soccer tips so long as your full-backs can keep an eye on their wide-players whilst you make all the plays through the centre of the field. To check out other formation options... click here! Another common formation is the 3-5-2 formation. This also provides a nice balance between defence and attack. 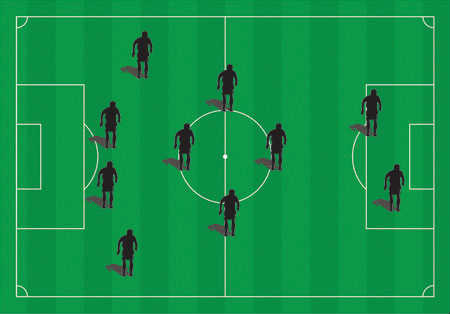 The 3-5-2 formation has 3 central defenders, 5 midfielders and two strikers. It is once again the midfield options that makes this formation popular. You can play with 2 defensive (or central) midfielders, 2 wide midfielders and 1 attacking midfielder as shown in the diagram. - To make this formation a little more attacking all you need to do is push forward one of the defensive midfielders to an attacking midfielder. - A negative side to this formation would be that you are only playing 3 defenders and therefore could be vulnerable from attacks out wide. Only play this formation if you have 3 solid central defenders who can allow the rest of the team to push forward.